Operation manager is a senior person in a company who has a job role of overseeing the operations related to construction. The main job of the construction operation manager is to ensure that all the operations of the company are being handled in the best possible way. They also ensure that the expectations of the company’s clients are also met. Saying goodbye especially from such a senior post of operation manager is not easy. No doubt, the decision of quitting the job puts everyone in an uncomfortable situation. The decision of moving on can be taken because of many reasons. Regardless of all those reasons, it is the demand of your professional life to maintain a positive and good relationship with your employer. The best way to part away is to write a resignation letter. Try to keep the resignation letter maximum of one page in length. Read the contract that you have signed with the company and then adapt your resignation letter according to it. It is important to let the employer know about your decision in an appropriate tone. Try to keep the tone as professional as possible. The employee resigning from the job should be thankful to the employer for providing the opportunities that have helped him gain the user experience. 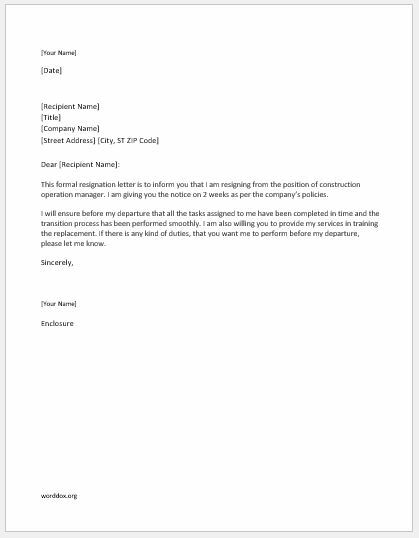 This formal resignation letter is to inform you that I am resigning from the position of construction operation manager. I am giving you the notice on 2 weeks as per the company’s policies. I will ensure before my departure that all the tasks assigned to me have been completed in time and the transition process has been performed smoothly. I am also willing you to provide my services in training the replacement. If there is any kind of duties, that you want me to perform before my departure, please let me know.